Kent Stuckey is a fourth generation farmer from Crawford County, Ohio. Together with his three sons, Ben, Zach and Ethan, they care for their 600 cows and 900 acres of cropland. In addition to providing excellent care for their cows and calves, the Stuckeys are partners of the Pickwick Place, which includes a market featuring produce grown by the farm. What’s it like working with your family every day? Kent: The farm has been in the family for over 115 years! I owned the farm with my brother-in-law, and when he decided to sell his partnership of the farm my sons came on board. We have different personalities and all think a little differently, which really complements the business. My oldest Ben is our crops and feed manager, Ben is our herd manager and calf specialist, and my youngest Ethan grows produce for The Market at Pickwick Place. We also have 14 employees who help on the farm. What are some ways you’re environmentally conscientious on the farm? Ben: We no-till plant all of our acres and plant cover crops. We plant annual rye grass with our corn, which does a really nice job of capturing nutrients, and it makes a nice seed bed for the corn. We also plant cereal rye as a cover crop that we will harvest as forage for the cows. That’s an additional benefit of cover cropping is that we’re able to harvest a second crop. Kent: We follow a strict nutrient management plan that we’ve had for at least 15 years. We take soil samples to monitor nitrogen levels every year and samples for other nutrients every three years. That really helps us determine how much manure and other nutrients should be applied to each field. We pay close attention to where our manure goes. Ethan: We are even able to use some cow manure to fertilize the produce, but are careful to follow strict food safety laws and best management practices. We can only apply to produce that are not eaten raw, like pumpkins and sweet corn. 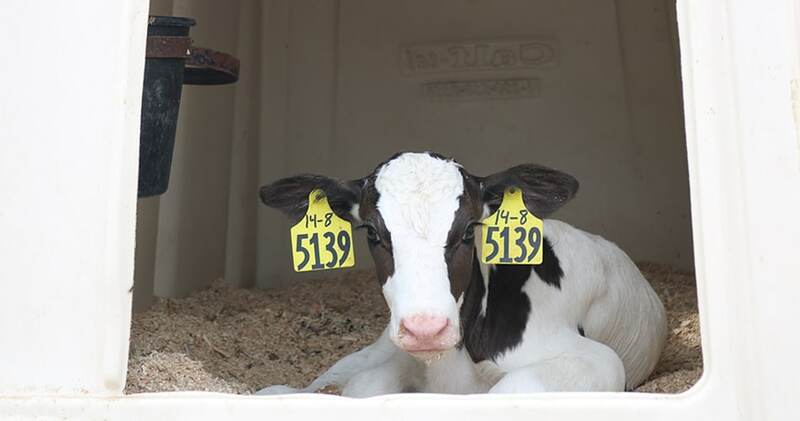 How do you provide the best care to your calves? Zach: Consistency is key – I meet with the calf feeders once a month to go over protocols and feeding schedules. We feed our calves three quarts of milk three times a day. We’re constantly changing and making things better. Keeping calves clean and dry is really important. We tell our employees if they don’t want to sit in the hutch, then it needs bedded and if they don’t want to drink water out of their water tub, then it needs cleaned.